The Upanishads try to remove the basic cause of our sorrow in life. All sorrows are expression of the experience of limitation in the Self. Hence Brahma Vidya is the highest Knowledge which removes the illusion of the duality in the world. 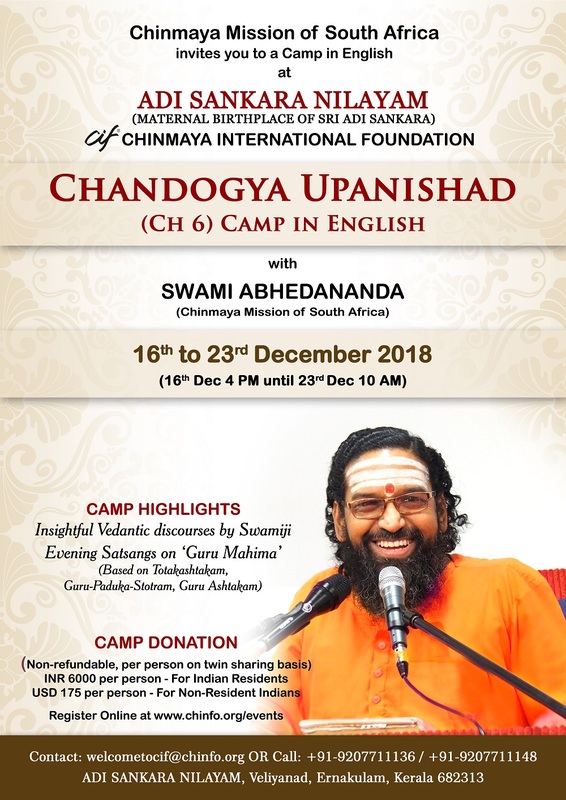 Chandogya Upanishad is one of the popular Upanishads in which the sixth chapter holds supreme importance because of the Mahavakya 'Tav Tvam Asi' enshrined in it. Instructing his son and disciple Shevtaketu, here Sage Uddalaka gives us the highest teaching of Oneness of the individual Self with the Self of all. Swami Abhedananda would explain this text with his illuminating, interesting and deep discourses. In the divine environs of the pious Adi Sankara Nilayam (Maternal Birthplace of Sri Sankara), delegates will also get to revel in evening Satsangs on ‘Guru Mahima’, wherein Swamiji will speak on the most important Stotras like Guru Paduka Stotram, Guruvasthakam and Totakashtakam! Do not miss this opportunity of listening to the rare combination of exceptional discourses on Vedanta as well as Bhakti, at the most sacred venue of Adi Sankara Nilayam!